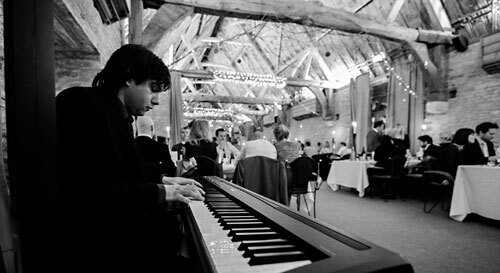 This versatile pianist/vocalist travels the country and can frequently be found playing for wedding ceremonies, drinks receptions or wedding breakfasts. 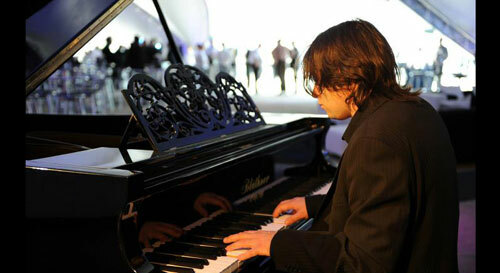 He can play jazz or classical instrumental piano music as well as offering jazz or pop piano and vocals. To be a profesional pianist, this acts feels it is very important to be able to read the audience's reactions in order to achieve the right ambience for any wedding or corporate event who have hired a professional pianist for entertainment. If the venue you are holding your wedding or event doesn't have their own piano, this pianist can provide a fantastic shiny black 'Grand Piano Shell', into which his electric keyboard fits. This looks and sounds like a BABY GRAND, but comes flatpacked and can fit just about anywhere! All the parts are moveable on a small trolley and it takes approximately 10 minutes to assemble or dismantle. Ideal if you want a quick turnaround after a wedding meal, in order to make way for the evening entertainment. This definitely beats paying hundreds for the hire of a real grand piano! 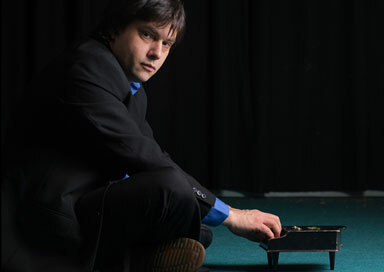 His new piano shell was designed and made by himself after an original design by himself and fellow pianist. I Just Want To make Love To you - Soul Agents/Rolling Stones etc. Money (That's What I Want) - Beatles etc. Some Other Guy - Richie Barrett/Beatles etc. Twist and Shout - Beatles etc. Will You Love Me tomorrow? - Carole King etc. Defying Gravity - From "Wicked"
Carousel - You'll Never Walk Alone, Soliloquy etc. Chess - I Know Him So Well, One Night In Bankok, Anthem, End Game, Pity The Child, Heaven Help My Heart etc. City Of Angels - You're Nothing Without Me, What You Don't Know About Women, You Can always Count On Me etc. Kiss Me Kate - Too Darn Hot, Where is The Life That Once I Led, Wunderbar etc. Music Man - Till There Was You, Marian the Librarian etc. My Fair Lady - Show Me, I'm Getting Married In The Morning, With A Little Bit Of Luck, I Could Have Danced All Night, I've Grown Accustomed To Her Face, The Rain In Spain etc. Oliver! - As Long As He Needs Me, Food Glorious Food, Where is Love? Etc. Secret Garden - Come To My Garden, Lily's Eyes, Wick etc. Singing In The Rain - Singing In the Rain, Make 'Em Laugh etc. Sweet Charity - Rhythm Of Life, Hey Big Spender!